Tiger Woods was playing like his old self today at the AT&T Pebble Beach Pro-Am, shooting a 67 in the third round to move himself within four shots of the leader Charlie Wi going into the final day on the Monterey Peninsula. His play has been tremendous thus far at Pebble Beach and so the question must be asked: is he back? Woods has really had a strong tournament thus far and it is the first tournament in which he opened with three straight rounds in the 60's since the 2009 Tour Championship at East Lake. And he was lights-out today, particularly in one eight hole stretch where everything was falling into place, and the vintage Tiger fist pump. Even as he failed to get a birdie on the final seven holes, it was some of the best play from Tiger in a while. It will be interesting to see if Woods can overtake Wi on the final day, we've seen him do it before and it could be possible that Wi gets a little intimidated that he has to hold off Woods, who has been playing of the best golf he has had. 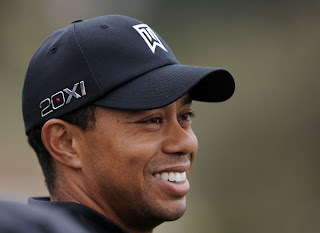 Based on what we have seen this tournament, it looks like Woods is back to be a contender every week on the PGA Tour. He may not be fully back just yet but it looks like he is getting his act together. And with the Masters three months away, if Woods is peaking at the right time he could absolutely get his fifth green jacket.